Xenon Ray(Xenon) is Clan Quest's local Vindicta entrepreneur, his business in Lances and Crests earning him over 4 billion gold since he started his business in 2016. He is greatly revered by the clan as a meme, and exercises an iron fist rule over Discord, which he gloriously founded at the end of 2015. As part of the RS Guild Council, the fate of your soul rests in part on him, which you have entrusted he will create glorious things out of. In RuneScape, Xenon is greatly skilled in the art of DPS, and lives to further his monopoly over the game. He has dedicated his life to Vindicta, his fountain of money youth, Quests, Clue Scrolls, and more PvM. 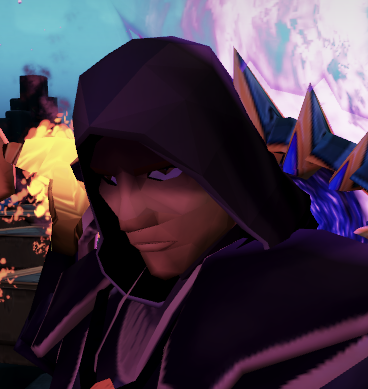 Such glorious habits have led him to rise into the ranks of the elite, and he is greatly recognised by the RuneScape community and commoners often turn to him for help and advice. In Overwatch, Xenon is a member of the secret society known as the Sombra Mains. They exist to tilt all those who oppose, and the same rings true for Xenon. He is skilled in the art of clicking on heads, and is a powerful user of Sombra, McCree, Widowmaker, and many more heroes. He mainly resides in Quick Play, until he finds motivation to participate in Competitive, which he then camps and increases his SR by a full rank each season he finds the motivation to. He currently resides in the wastelands of Plat, and will one day rise up to the slums of Diamond, all in his time.